Ross County is rich in history. From the eagle weather vane to the fabled Burton E. Stevenson, libraries have always been a part of that story. By the simplest measure, Chillicothe and Ross County Public Library is a little more than 50 years old (see 1968). By other counts, you could say we’re over 160 years old, even over 200 years old. We are fortunate that many folks over the years had the foresight to clip newspaper articles, take photos, and keep newsletters and correspondence. 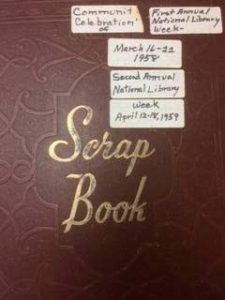 Combing through scrapbooks, dusty boxes and folders, we’ve compiled a timeline highlighting the history of Ross County library services. December 18, 1800: William Speer places an ad in the Scioto Gazette requesting the return of private library materials. 1801: the first Ross County Courthouse is completed. An eagle weathervane is installed atop the cupola. 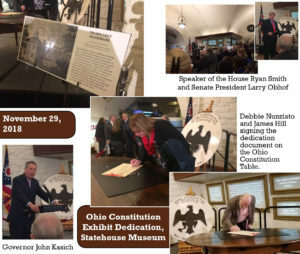 1803: Chillicothe becomes the first capital of Ohio. The courthouse becomes the first capitol building. 1809: the Academy, Chillicothe’s first school, opens. 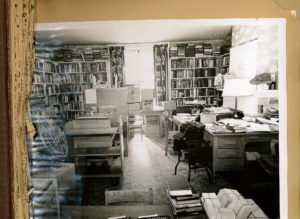 The Worthington Literary Society’s library is founded. The collection is later incorporated into the city library’s collection. 1811: Dr. Amaso Delano advertises a circulating library available in his drug and book store. 1825: Joseph Kerr opens a public reading room, charging $3 per year to join. February 27, 1826: Benjamin Masters opens a reading room in his tavern on Paint St. It closes one year later. March 20, 1827: Joseph Kerr’s reading room opposite the Paint Street marketplace closes. August, 1836: The Chillicothe Library Association is organized. Members include Henry Massie and Edward Allen. 1850: the state legislature authorizes the expenditure of public funds for the establishment and maintenance of school libraries. 1854: Edward H. Allen, city school superintendent, raises $300 to help start a Teacher’s Library. 1856: a Young Men’s Gymnasium and Library Association is formed. November 22, 1859: first city librarian, William B. Franklin, appointed. 1866: Judge B. F. Stone, president of the Board of Education, proposes consolidating three embryo libraries (the Teacher’s Library, the state-funded school library, and the Young Men’s Gymnasium library) into one free, public organization. He further proposes that the school should appropriate one hundred dollars annually to purchase new books. A permanent fund of $2,000 is also set aside. 1867: William B. Franklin is named first librarian of the formal library. 1868: total circulation of the Chillicothe Public Library is 3,253. Late 1860s: state legislature allows cities to levy a tax of one-tenth of a mill on property. This provides approximately $800 annually for new books. Contingent expenses are paid by the city. 1871: library reports six thousand items on its shelves. 1874: library is temporarily moved to the Court House. 1876: library moved from Central School building to the top floor (now removed) of the city building. Henry Watterson is appointed librarian. The eagle weathervane (with bullet damage noted) is mounted in the library. 1887: James M. Burrows is appointed librarian with an assistant, Elizabeth (Lizzy) Butler. Under his management, the library starts using standard library procedures for shelf organization. September, 1899: Burton E. Stevenson begins his 58-year tenure as librarian. His assistant, Newton B. Overly, is also the city’s truant officer. 1901: the Chillicothe Public Library reports an annual circulation of nearly 30,000 items. January, 1906: The school board sets aside lot 36 (140 S. Paint St.) for the construction of a public library. The city accepts a gift of $30,000 from Andrew Carnegie for building construction. September, 1907: the new Carnegie (Main) Library opens with a collection of 26,000 volumes. The eagle weathervane from the first state house is proudly displayed above the circulation desk. 1930: the Executive Committee of the Parent-Teachers Association of South Salem commences clean-up work on south upstairs room of the old Academy building to be used as a public library. 1936: Frankfort Public Library organized. A WPA deposit collection is started in the Kingston grade school. 1941: the Main Library collection totals 70,000 items. 1946: Susanna Titus, the Ross County Library Supervisor, reports a budget of $8,953.55 to operate four public libraries in Frankfort, Kingston, Bainbridge, and South Salem. July, 1951: the Ross County Library District is established and consolidates the four previously independent public libraries. The combined library system has a collection 30,000 items. 1951-1968: Ross County Library District headquarters are located on West Second Street, then moved to West Fourth Street in 1956. October, 1951: Ray Embree is appointed County Library Director. He is jointly employed by the Pike County Free Public Library. He spends 3 days per week in Ross County. 1952: the Ross County District Library adds library services (via contract) to Clarksburg High School and Southeastern High School in Richmond Dale. Summer, 1954: Burton Stevenson asks the Junior Civic League to move their Bookworm program to the Main library. Started in 1952, it continues to be a popular part of summer in Ross County. Summer, 1956: The Kingston Library moves from the Kingston grade school to the high school. When the library room was needed for school purposes, the public library was closed on January 15, 1957. With support from the community and village council, the library reopens in the center of town on May 13, 1957. 1957: The Chillicothe Public Library maintains collections and public hours in Worthington, Mount Logan, Tiffin, and Western schools. May, 1957: Frankfort Library moves to Main Street. September 1, 1957: Burton E. Stevenson retires after 58 years as librarian. The Board hires Carl Vitz, former librarian of the Cincinnati Public Library, to conduct a thorough assessment of needs before hiring a replacement. Among Vitz’s recommendations is a heavy weed of the collection and suggestions for upkeep of the 50-year old building, including remodeling of the first floor and painting the interior walls. December 12, 1957: Stewart H. Button is hired as librarian. His first day is February 1, 1958. 1958: the city library’s approved annual budget is $40,203. 1958: a “teenage section” is established at the Main Library. February, 1958: a south stack addition is completed on the Carnegie building. New flooring, furniture, and light fixtures added. May, 1958: a tax distribution dispute between the county and city library is heard at the Ohio Supreme Court. The city library argues that the tax dispersion is disproportionate; they are receiving only 32.69% of the collected revenue, but the county, for the next budget year has requested an increase to 74.37%. The case is remanded back to the Tax Appeals Board, which ultimately rules in favor of the city, adding just over $2,700 to the city library’s budget. April, 1958: after only two months, Stewart H. Button resigns to accept a position at the Huntington WV Public Library. Ms. Edna Brust is made acting librarian. June 9, 1958: Marie Louise (Mary Lou) Sheehan appointed librarian. 1959: the city library reports an annual circulation of 48,967 items, a 39% increase over 1958. July, 1960: the Chillicothe Public Library assumes operation of the Ohio University branch library, temporarily housed in the Presbyterian Church. August 1, 1960: South Salem Library opens in a new location (a vacant store building) after 30 years in the Academy building. 1961: the city library reports an annual circulation of 209,249 items! 1962: the city library maintains collections in Mt. Logan, Tiffin, Western, Worthington, McArthur, Allen, and Massie schools. 1962: the county library’s bookmobile has 12 regularly scheduled stops: Adelphi, Hallsville, Zane Addition, Chillicothe Manor, Londonderry, North Fork Village, Schrader Addition, Anderson Station, Bourneville, Reformatory Village, Pleasant Valley, and Clarksburg Pike. September 4, 1962: Frankfort Public Library reopens after construction of the new high school, which includes a large room for the library. May, 1963: a small fire at the Ross County Library on W. Fourth St. destroys books, shelves, and windows. Structural damage is estimated at $125 and contents at $250. Arson suspected. 1964: Governor James A. Rhodes’ “Little Hoover Commission” recommends consolidating library services and collections across the state as a cost-savings measure. 1966: Ohio University library gets its own space on campus. August, 1967: the lease for the land on which the Main library is located was “renewed forever” by the Chillicothe Board of Education. October, 1967: Ray Embree named Ohio Librarian of the Year. August, 1968: Ray Embree, county librarian, dies suddenly while attending to his ill father in Great Bend, Kansas. 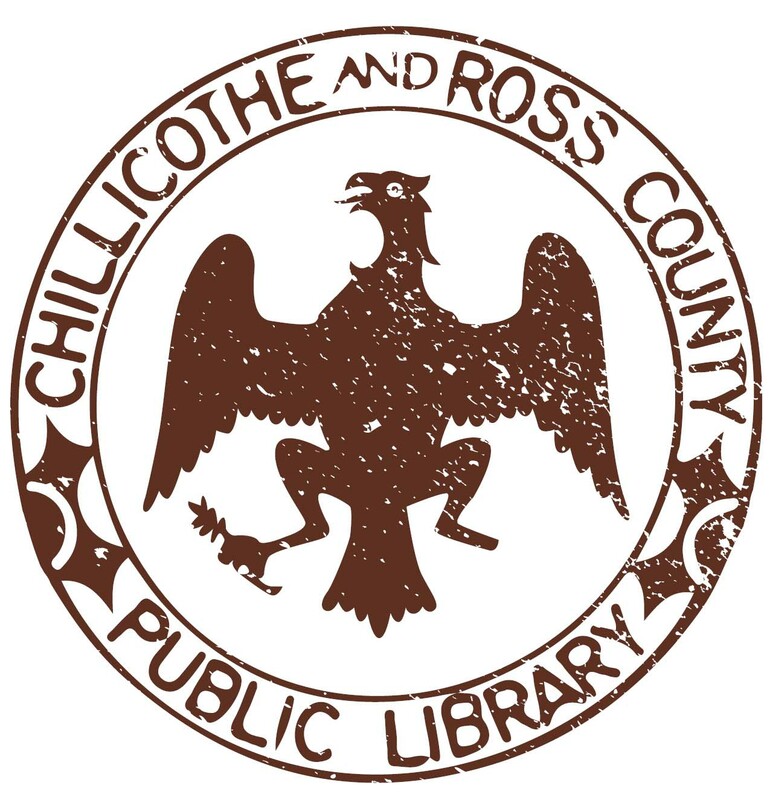 August 22, 1968: after rancorous debate for many years, the county and city libraries vote to merge, forming the Chillicothe and Ross County Public Library. November, 1968: A. T. Dickinson, Jr. of the Mansfield Public Library is hired as a consultant to facilitate the merger of the county and city libraries. February, 1969: consolidation is complete. Mrs. Francis X. Sheehan is the first Director of the Chillicothe and Ross County Public Library (CRCPL). Mrs. Embree is made her assistant. The new library has a staff of 35 (17 full-time). A new governing board is formed with four members appointed by the county commissioners and three appointed by the county judge. The new library consists of the Main library on Paint St. and an Extension Library at 53 W. Fourth St. with branches in Frankfort, Kingston, Bainbridge, Richmond Dale, Clarksburg, and South Salem and a station in Mooresville. A second station is planned for Huntington Township Hall; library services are also provided to Roweton Boys Ranch. 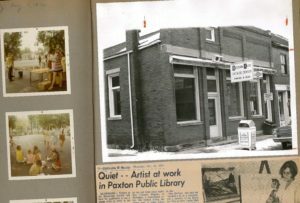 April, 1970: the Paxton Township Public Library at Bainbridge holds an open house in their remodeled location located next door to the old site on Main St., sponsored by the Philomathean Club. The Bainbridge Boys Club is recognized for assisting with the move and the Bainbridge Garden Club provided floral arrangements. February, 1973: grant funding for large print books is requested from the State Library to be divided between Pike and Ross Counties. That same month, CRCPL is one of 25 libraries chosen by the State Library to participate in an inter-library loan pilot project. September, 1974: the library Board of Trustees is offered the old post office building on the corner of 5th and Paint by the federal General Services Administration. After review, it is estimated that it would cost $250,000 to install an elevator and make the necessary renovations for it to function as a proper library. The gift is rejected. Plans are made for further improvements to the Carnegie building. 1975: the Special Services Department is established. 1976: the Main Library (Carnegie building) is remodeled. An elevator is added and front steps removed, making it more wheelchair accessible. 1978: after months of debate, a city ordinance make wheelchair-accessible parking available on the street in front of the Main library. 1980: Mary Lou Sheehan retires as library director. Jennifer Thompson McKell is hired. August, 1983: the library starts circulating video cassettes. November 4, 1983: Emelyne Ely Reed, president of the library board and president of the Ohio Valley Area Libraries Board, is inducted into the Ohio Library Association Hall of Fame at the Conference of the Mid-West Federation of Libraries in Cincinnati. June, 1984: The Chillicothe Telephone Co. donates VICOM equipment to the library. The machine is able to send “electronic mail” to other stations located at the high school, the Senior Citizens Center, the Ohio University branch campus, the vocational school, and Movie World Pizza. Due to “patron misuse,” the service is discontinued and the VICOM network becomes “essentially an electronic newspaper” terminal. October 8, 1984: Howard S. Young, a former Adena High School principal and educator, bequeaths his house on Springfield St. to CRCPL to be used as a library. The building opens to the public, after renovation, on November 17, 1987. The library Board of Trustees recognizes Mr. Young’s gift by officially naming the library The Howard S. Young Public Library. 1987: Scioto Valley Local School District offers to provide property for a new Richmond Dale branch to CRCPL for $1. June, 1987: the library takes steps to begin the conversion from a paper card catalog to a machine-readable format for an automated book database. The process is expected to take two years. December, 1987: CRCPL accepts ownership of the Paxton building in Bainbridge as a gift from Mrs. Amelia Benner. December 31, 1987: CRCPL discontinues contracts with the Chillicothe City Schools for library services. 1988: CRCPL purchases the historic Kingston building from the Ellis family. The Kingston Library has been located in the north half of the structure since 1957. March, 1988: The Public Services Committee recommends purchasing an Apple IIc (at a cost of $778) for basic word processing use by patrons at the Main library. January 14, 1990: The Kingston Library (housed in a building likely built in 1816) reopens after an extensive restoration. It is featured in the national publication American Libraries. May, 1991: in the library’s newsletter, the library director announces that CRCPL intends to be completely automated by the end of the year. August, 1991: Bookworm is extended to the county branches. January 5, 1992: after many years, the Main Library is again open on Sundays during the school year. October 4, 1993: Richmond Dale branch opens in a new building on Main St.
January, 1994: all books and library cards now use barcodes for speedier transactions. May, 1995: the paper card catalog is removed from the Main library. 1996: the Northside Branch opens in Chillicothe. 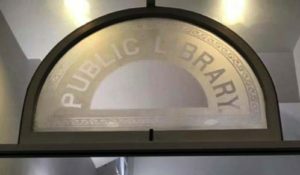 The building incorporates a historic window over the front doors that reads “Public Library.” The window was part of the old city building, which housed the library prior to the Carnegie building. March, 1996: the county’s libraries are connected via a computer network for the first time, allowing patrons in any branch to see the holdings at the other libraries. 1998: Main library undergoes renovation. 2000: Buckskin Elementary in South Salem is remodeled with a dedicated school/public library space. February 12, 2003: the Ohio Historical Society and the Ohio Bicentennial Commission install a marker honoring Burton E. Stevenson in front of the Main library. April, 2004: CRCPL purchases the Central school building (directly behind Main) for $525,000. 2009: state funding for public libraries is drastically cut due to a national recession. The Northside Branch is shuttered. Staffing and hours are decreased. 2011: Jennifer Thompson McKell retires. C. Nicolas Tepe is hired as Director. January, 2011: after successfully passing a county-wide operating levy in 2010, the Northside Branch is re-opened. 2012: the Howard S. Young Library in Frankfort reopens after a complete remodel and expansion to include a meeting room. September, 2012: the Central school building (Main Library Annex) is renovated to include meeting rooms and offices. September, 2013: CRCPL unveils a new logo and updated website. 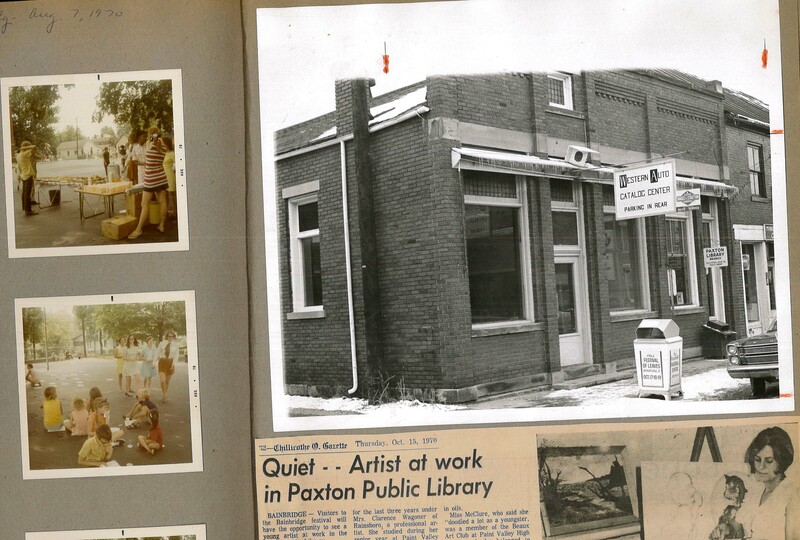 June 19, 2014: the Paxton Library moves into the old elementary school, now a community center. August, 2014: CRCPL opens a library branch inside the Huntington High School and shares space with the high school library. 2016: C. Nicolas Tepe resigns the directorship to accept a position in Athens County, Ohio. 2017: a satellite library is established at Mt. Logan School in preparation for its conversion to an educational resource center. 2017: CRCPL reports 406,220 items circulated. February 16, 2017: James Hill is hired as Library Director. 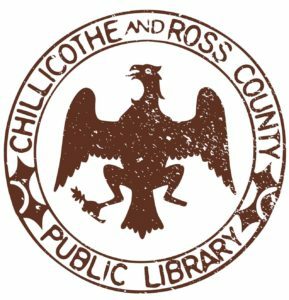 March, 2017: Chillicothe and Ross County Public Library goes fine free. August, 2017: all library campuses in Ross County became tobacco free. November, 2017: due to building deterioration and safety concerns, the Kingston Library is temporarily relocated to 89 Main St.
October, 2018: CRCPL enters into contract to buy 29 N. Main St. in Kingston. The lot is near the old Ellis building and includes a free-standing building built by the school system in 1974. 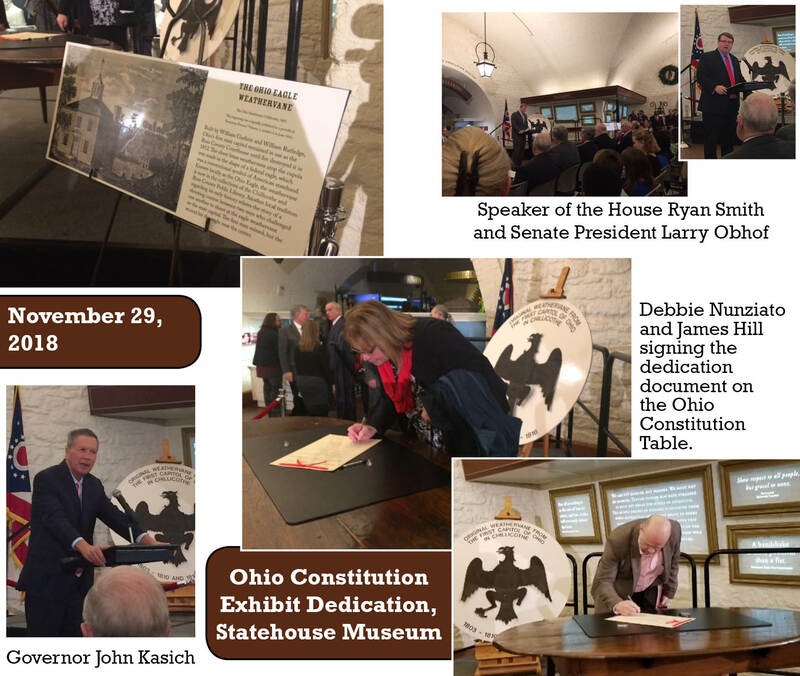 November, 2018: the heralded Ohio Eagle weathervane is displayed at the Ohio Statehouse during the opening reception of a new Ohio Constitution display. Several elected officials attend the opening. January, 2019: the new Chillicothe elementary schools officially open and the Mt. Logan location becomes exclusively a public library. The library is renovated in August, 2019. March, 2019: The Huntington high school collection is removed, the site is renovated, and the location becomes specifically a public library. Of course, a timeline isn’t a narrative. Reading between the lines, there’s a bigger story here that’s still being told. If you have anything to add, let us know in the comments. Interesting and informative. Great job!